We were so elated to celebrate Christmas and my hubby’s birthday with Mandy Harvey at Dazzle! This was our third Christmas Concert and I am so very thankful to be able to go and have never had a problem with chemicals there (air fresheners and perfumes). It was SO great to see Mandy and give her big hugs! I have missed her! She has really been busy after being on America’s Got Talent in 2017! As you probably know, she placed forth! We are so very proud of her and are elated that she is able to live her dream of singing and a making a difference in this world with her message of love and perseverance! I am SO excited to see my friend, Mandy Harvey on America’s Got Talent! I have been to several of her concerts and events through the Invisible Disabilities Association. She is AMAZING! Her voice gives me chills, with her incredible, unique tone. I have been so blessed to spend time with her over the years, not only because of her voice, but because of who she is as a person. Mandy has a passion to encourage people to never give up, keep trying and believe in yourself. She is simply has it all. She has a spectacular voice, story of perserverance, inspirational message, adorable personality and exquisit beauty. I am so very proud of you, Mandy! You are going to take this world by storm!I love you, Miss Mandy! Mandy lost her hearing due to a connective tissue disorder when she was 18. She was a music major, so this loss was devastating! Mandy wasn’t sure what to do next, but her father encouraged her to pursue her singing career anyway. Today, she works very hard every day to keep her voice in shape and in tune. Mandy has produced three CD’s and has performed for many prestigious venues. Did you know that Mandy was the recipient of the 2015 IDA Inspiration Award, the 2016 Special Guest Entertainment for the IDA Awards Gala and an IDA Ambassador? What’s more, Mandy and Pete Ohlin just released their new single, “Together!” This song was first debuted at the IDA Awards Gala and released to the public in 2017. This ballad was created to bring awareness, encouragement and hope to millions who live with illness, pain and injury around the world, in honor of the Invisible Disabilities Association‘s program, Invisible No More!®. Nonetheless, “Together” inspires us all to be more empathetic and supportive with one another. Download the single, “Together” Today! A portion of the proceeds go to IDA when you download it here! Watch Mandy in Concert at the IDA Awards Gala, in national interviews and on America’s Got Talent on YouTube! Later, the contestants were pared down from 10 to the Winner and Mandy placed forth. She was very gracious and grateful for the opportunity, experience and fans. Landing in third was Light Balance, second Angelica Hale and the 2017 AGT Winner was Darci Lynne Farmer. Congratulations to all the contestants who made it into the Finals! That is quite an honor! Congratulations, Mandy! We are so proud of you! 9/19/2017 Finals Show: In Mandy’s pre-performance package, she shared the sorrow of losing her hearing and the day she decided to “get back up” and how she encourages others to keep fighting and never give up! After the film, Mandy shared a newer original song, “This Time.” Mandy choked back some tears in the beginning, after such an emotional film beforehand. Nevertheless, this easy going song wrapped up her passion to keep “moving on” and chase her dreams. 9/12/2017 2nd Semi-Finals Show: Mandy Harvey you were AMAZING! I just knew you were going to sing, “Release Me!” It was absolutely STUNNING! I am so thrilled that Simon gets it and he put it all into words so beautifully. It is obvious he loves your story and your incredible perseverance, but he made it a point that his comments were based solely on your voice and performance! Wow! That is exactly what you wanted to hear! 9/8/2017 Mandy’s Fan Video: Mandy Harvey published her video compilation of #Vote4Mandy fan posts and videos! Of course, when Mandy asked her fans to take pictures with #Vote4Mandy #AGT, I jumped on it! And so did my kids! Tee hee! This is another reason why I love this girl so much! She is not just in this for herself. She is not only inspiring people to “Try,” she strives to share her journey and show her #gratefulness for her family, friends and fans! Don’t forget to watch on America’s Got Talent on September 12th and #Vote4Mandy on #AGT! Let’s make sure she gets in the finals! Thank you for being YOU, Mandy! We are cheering you on, every step of the way! 9/7/2017 #Vote4Mandy Facebook Frame: Mandy Harvey Fans! Check out this super cool Facebook Frame I made that you can add to your profile photo! Simply click here to add this frame to your Facebook profile photo! Don’t worry, the copyright will not appear on the actual frame! I’m so excited they are being used on Facebook! See below! But don’t tell anyone … but we got to go backstage and get hugs! I have missed you so much, Mandy! More Details. 8/22/2017 Quarter Finals: Mandy has an unique, angelic voice that was born out of talent, perseverance and hard work. The performance of her original song, “Mara’s song” was ethereal, haunting and beautiful! There is no denying, she is gorgeous inside and out. And her inspirational message of hope encourages everyone to make a difference in someone else’s life. She has it all! 6/7/2017 AGT Audition: We are so proud of Mandy Harvey! Mandy made her debut on America’s Got Talent last night with her original song, “Try.” This song was inspired by Mandy’s struggle to start writing and singing again after losing her hearing. She was afraid. Nonetheless, with the encouragement of her parents and Eric Weihenmayer of No Barriers, Mandy decided to “Try.” And now she encourages others to “Try” despite their fears of failure. Mandy’s beautiful voice, spirit and message to never give up came beaming right through the hearts of people around the world. The judges and audience were on their feet cheering for Mandy and Simon Cowell gave her the #goldenbuzzer! Simon had sworn he would not use his golden buzzer right away, but he knew Mandy was the one! He was so taken back by her amazing story, but he was most impressed by the incredible tone of her voice! As a result, she is #1 trending on YouTube with over 2,000,000 views and soaring! I told you that you were going to take this world by storm with your gorgeous voice and beauty inside and out, Mandy Harvey! Your message to “Never Give Up!” is ringing loud and clear across the globe! I am so proud of you, my friend! You have over 9 million views and counting! I love you Mandy Girl! Behind The Mask with Cassandra Perkins 95.3 FM 1220 AM KLDC with Radio Host and IDA Ambassador, Cassandra Perkins. Special Guests: Founder, President and CEO Wayne Connell with Invisible Disabilities Association and IDA Ambassador, Mandy Harvey. Mandy is an award winning singer, songwriter and motivational speaker who just happens to have an invisible disability. Mandy lost her residual hearing in 2006-2007 at age eighteen due to a neurological disorder. Have you subscribed to my blog yet? Are you following me on YouTube, Twitter, Instagram, Google+ and Pinterest? What are you waiting for? 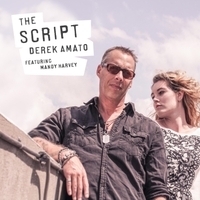 Our amazing friends, Derek Amato and Mandy Harvey have just released an incredible new single, “The Script.” Download it today! This song gives me CHILLS! Derek and Mandy both have stories that are no less than amazing and spectacular! In 2006, Derek was tossing around a football a a get together with friends. He decide to catch the ball as he jumped into the backyard pool. Unfortunately, he was in the shallow end and got a serious concussion. After being examined and treated at the hospital, his mom took him to her house and he slept for days. Soon after, he went to visit a friend. He was sitting there talking and found himself drawn to his friend’s keyboard. Though he had tinkered around with the guitar and he loved music, he didn’t know how to play the piano. Finally, he couldn’t resist the pull, walked over and sat down. He placed his hands on they keys and began playing fluidly and beautifully for hours! Along with Derek’s incredible new abilities, he also battles insomnia, along with some memory and cognitive dysfunctions. Derek is the first one to tell you he has been given a gift and he is determined to use it to make a difference! Derek brings awareness to children and adults living with cancer, autism, mental illness, homelessness and people with disabilities. Derek is on the Executive Board of the Invisible Disabilities Association, a non-profit organization that encourages, educates and connects people and organizations touched by illness and pain. Derek heard Mandy sing and was quite impressed with her amazing voice and style. Several years later, he felt compelled to get in touch with her. At that point, he learned Mandy’s story. Mandy had a passion for singing and music at a young age. Though she began having trouble with hearing loss, she kept pursuing her dreams. She went to Colorado State University for music education, but while there, lost the rest of her hearing and was removed from the program. This, of course, was devastating to Mandy! Nevertheless, her father encouraged her to continue her love for music and not give up on her dreams. She began training herself how to sing without her hearing. She does so through muscle memory and with the help of an app on her phone to help her find “middle c.” Mandy takes off her shoes and feels the rhythm of the music through the vibrations on the floor.